In Ladakh, the rest of India is referred to as down . Because, at no point in Leh district would you be less than about three kilometres above the mean sea level. This vast barren district is more than 45,000 square kilometre (sq km); it is perhaps India's largest and certainly its most sparsely populated. It is not easy to live here. The limited water available in rivers and streams is the melt from the glaciers -- between the water of the monsoon and Ladakh stands the Himalaya. Plant and animal life is mostly restricted to what the human will can salvage in the face of hostile elements -- temperatures drop to -20C to -50C in the winter. All roads through mountainous passes remain closed for more than seven months a year. Means of livelihood are restricted to agriculture -- restricted to one short season in summer -- and livestock rearing. The soil is sandy and retains little water. Yet people have prospered in the rarified air of this desiccated trans-Himalayan landscape for hundreds of years -- the road connection to Srinagar came only in 1960. The key has been living with the harsh ecology and adapting, innovating. Ladakhis use dry toilets that turn human excreta into rich organic manure. They grow crops that use little water. As labour is difficult, they have cooperative farming. They have organised their society -- Buddhist or Muslim -- along a structure thats essentially democratic. Paucity of resources does not create conflict -- only more cooperation and consensus. Living in harmony with people and nature is not an ideal here. It is a prerequisite of survival. Ladakh comes under Jammu and Kashmir (J&K), and the Ladakhis do not like this at all. An agitation began in 1989, demanding Union Territory status. There were violent episodes. The Union government has always had a soft corner for Ladakh, and in 1995 during the Governor's rule, Leh district of Ladakh (the other Ladakhi district is Kargil) took its first step towards autonomy: the Ladakh Autonomous Hill Development Council (LAHDC), Leh. As elected representatives came to power in the council, there began an era of self-rule. The challenges facing Leh are unique. While agriculture is falling victim to the warped policies of the Union government, the armed forces have emerged as the biggest employers in Leh district. Tourism, too, provides a much needed means of livelihood and has grown rapidly in the recent past. But it puts a lot of pressure on the fragile environment. The Ladakhi political leadership in the LAHDC is grappling with many such challenges. It is trying to chart a course that is conducive to the environment of the region. Will Ladakh achieve economic development without harming its delicate balance? Here are some examples of the challenges and their responses. In Ladakhi, lango khel means conquering the highest point of a pass in the mountains. In Ladakhi schools, it means the matriculation (class X) examination. From 1947 to 1998, matriculation results in Leh district hovered between 0-5 per cent. The reasons are not difficult to fathom. Children grew up speaking Ladakhi at home but learned their lessons in Urdu, the official language of the state of J&K. After middle school, the language of instruction changed to English. There was great shortage of teachers, corporal punishment was common and teacher absenteeism had as much to do with lack of training and incompetence as with non-Ladakhi teachers getting unwillingly posted to far-flung, intolerably cold corners. Textbooks used terminology and symbols such as fan, train, ship, sugarcane and coconut, which are as strange in Ladakh as snow in Chennai. "There was no recognition in the education system that though Ladakh is a part of India, it is Central Asia for all practical purposes," says Rigzin Spalbar, LAHDC's executive councillor in charge of education, who is at the centre of an education reform process. Things started changing in the 1990s. 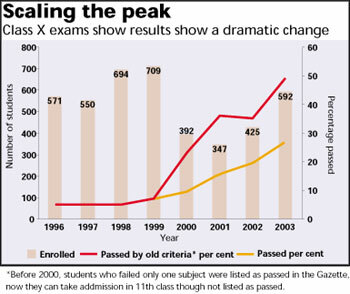 In 2003, the matriculation result went up to 49 per cent (see table: Scaling the peak), with a government school in remote Turtuk recording a 100 per cent result. This quite unbelievable change was achieved with some remarkable synergy among social groups and politicians. The root of the reforms lies in the work of a social group, the Students' Educational and Cultural Movement of Ladakh (SECMOL) headed by Sonam Wangchuk, an engineer by training and educationist by choice. While reading the National Policy on Education of 1968, Sonam had learnt of village education committees (VEC). These committees had parents working closely with teachers to ensure the smooth functioning of a school and maintenance of its essential infrastructure. SECMOL took up a government school in Saspol village in the early 1990s, formed a VEC and trained its teachers in widely acknowledged tools to make education interactive and interesting. It changed the medium of instruction to English by consensus. The results came in three years -- a private school had to shut down as all the students shifted to the government school. These elements became a part of an integrated education reform package called Operation New Hope (ONH). As Ladakhi politicians were closely involved with SECMOL, since its inception the LAHDC adopted ONH as its education policy soon after its formation in 1995. The first move of the autonomous council towards reforming Ladakh's education system was the creation of a VEC in every village (to support and monitor the schools). Phuntsog Angchuk, a resident of Saspol who chaired the VEC in the mid-1990s, can show you the rooms of the school that VEC members built with free labour. The next step was making English the medium of instruction from the primary level onwards. The fact that Ladakh was under President's rule helped. The state government would not have agreed to replace Urdu. Now, the challenge was to take the Saspol experience to the remote parts of Leh district, especially in the Changthang Plateau bordering Tibet. "We are short of resources and most of our students are first generation literates. To improve the performance of high schools in remote areas, we had to pool the resources of several schools into one and provide residential facilities to the students," says Spalbar. This meant that several schools had to be downgraded, a very unpopular move that the state government would never have approved of. To ensure that any change was a result of popular consensus, politicians started holding public meetings . The council does not approve any additional educational funds till the village community shows interest. Says Spalbar, "We knew that the reform had to be managed at our level. So, we simply avoided procedures that would require approval of the state government and instead relied on popular consensus." The first area picked up in 1997 was the Durbuk block on the Changthang plateau bordering Tibet. The weather here is harsher than in the rest of Leh district. The block had three middle schools and one short-staffed high school in Tharuk. The villages in Changthang are small and scattered. Students had to walk long distances to reach the high school. SECMOL offered to design and build a solar-heated residential school in Tharuk with financial help from a donor agency. The villagers agreed to downgrade the middle schools to primary schools. But, this was done at the district level by moving teachers around, without seeking any state government approval. Work on the school finished in 2001. Every family in all the villages contributed four weeks of voluntary labour, which amounts to Rs 14,00,000. The management board created to run the school included members of the community, the LAHDC, SECMOL and two students' representatives. Since then, three high schools and three primary schools have been provided residential accommodation in Leh. Spalbar clarifies that this centralisation is only to pool resources. "As reforms settle in, we would decentralise the school system," he promises. The solar-heated building of the residential school in Tharuk requires no heating in winters: the school can stay open in winters and close for vacation in summer when children help their parents in the fields. "We think that the schools can impart vocational training by shutting down in summer, so that the children can learn agriculture," says Wangchuk. Besides, attendance goes down in summer anyway. Since there is very little activity in winter, it is the ideal time to study. LAHDC now plans to change vacation timings across Leh district. Instead of shutting down from December 15 to the end of February, they plan to open schools on February 1. The month taken away would be divided into two 15-day holidays during the sowing and harvesting seasons. But changing vacation timings is a difficult proposition because Ladakhi winters are very cold and unless heating arrangements are made in schools, it is impossible for them to function. The council is trying to mobilise public opinion on the issue. It has taken the first step in Nubra valley, where providing heating is not as difficult as in rest of Ladakh, thanks to an abundance of vegetaion. Schools here would open in February in the coming year. This experience would be used to determine how the change in vacation timings is to be implemented in the rest of Leh. While ONH was underway there was resistance from the teachers' lobby. Since April 1999, zonal education officers have taken action against 88 teachers on the basis of complaints filed by VECs. In some villages, VEC members take turns to provide teachers tea at times when absenteeism peaks, such as Saturday noon. The teacher has to be present when the tea arrives. LAHDC has also decided to withhold the increment of a headmaster if the school's result is lower than 50 per cent. In such cases, the headmaster can also be removed from charge and made an ordinary teacher (though the headmaster can't be technically demoted). Besides, if the results are below 50 per cent in a particular subject, the teacher in charge of that subject loses an increment. The teachers complain that a system that has rotted for 50 years cannot be reformed at one stroke. In fact, some of them also note that the improved results have much to do with teachers encouraging cheating in examinations to avoid losing their increments. But, Wangchuk points out that ONH is not about persecuting teachers. There are several schemes to honour teachers who perform well. In remote areas, where accommodation is a problem, the VEC provides furnished accommodation to the teacher. March 1 has been declared as the day to honour teachers. Since transfers are a major cause for teachers' anger, the LAHDC has divided all the schools in four categories according to the level of difficulty in the area. The teachers have to take turns to be posted in rotation to each of the four zones, though women teachers are not posted in the most difficult areas. Up to class III, textbooks designed by SECMOL have been adopted across the district. These books rely on widely approved ways to improve instructions by making them interactive and relevant. Now, textbooks for classes IV and V are being developed by a committee that includes the council, SECMOL and a representative of J&K's education board. The target in Leh district is to cross the 70 per cent success rate in the matriculation exam by 2007. It is very likely that lango khel will soon mean only scaling a mountain pass in Ladakhi schools. Life in a cold desert is harsh and exacting. You need enormous amounts of energy for everything, but there are very few sources. Getting electricity to light up houses in Leh is no easy task. About two-thirds of the power supply in the summer comes from diesel generator sets (DG) sets -- and this does not include the numerous power sets run by families, businesses and institutions. In 2002-03, the power development department of Leh burnt 2.57 million litres of diesel (at a daily average of more than 7,000 litres) costing over Rs 5.65 crore annually. And all this to supply power for about five hours in the evening. In the winters, the DG sets are the only source of power as the other source -- the hydel power plant on the Indus river at Stakna, about 40 km upstream of Leh city -- freezes up for about two months. The other problem with the hydel plant is that the heavy silt load of the Indus prevents its optimum operation. Desiltation is very costly. Ladakh is not connected to the national electricity grid. Traditionally, people relied on cakes of cattle and yak dung to keep warm. But with tourism opening in 1971, came new demands. Now, tourists living in hotels expect hot tap water and a steady supply of electricity. Ladakh is providing answers to this situation in charactersitic fashion. Leh city has done a remarkable job of reducing its energy demand by introducing compact fluorescent lamps (CFL) that consume one-fifth the power that conventional light bulbs need by reducing the number of illegal connections and trying to tap the vast potential of solar power. Electricity shortage and numerous illegal connections. These problems plague every Indian city. The answer, many pundits will tell you, is to privatise power supply as public sector companies cannot take tough, unpopular decisions. 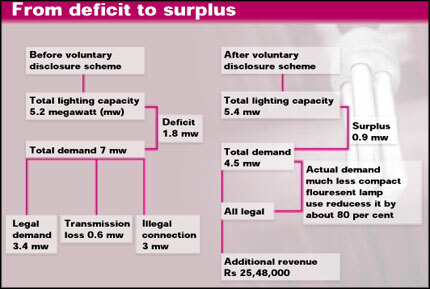 In Ladakh, however, the public sector power supplier has not only managed to regularise a majority of power connections and improve its revenue recovery but actually got people to spend several times extra to install energy efficient lighting systems. Take the case of the LAHDC's decision to replace conventional lamps with CFLs -- first in commercial establishments and government offices. While CFL saves energy, it costs a lot to install. What LAHDC was asking the people to do was to spend more money on new components and expensive bulbs. "The key to our success lay in controlling the price of CFL and to demonstrate to the people that if they saved energy, the supply of power would improve and their power bills would come down," says Tsewang Paljor, assistant executive engineer with the power department. The price was controlled by selling subsidised 14-watt bulbs at Rs 180 each through cooperative societies and getting the private sector suppliers to lower the price. The price of the 18-watt bulb came down to Rs 250 from Rs 280. By September 2003, 37,000 CFLs had been sold in Leh, saving as much as 30 per cent of the total power consumed in Leh for lighting. The power tariff structure of consumers with 250 watts of consumtion or more was made such that if they did not switch to CFL, they would have had to pay higher rates. A social consensus was created on the need to save electricity. Today, several homes and establishments, especially hotels, have one CFL and one conventional lamp in the rooms. In summer, when the power supply is better, they use conventional lamps. In winter they switch to CFLs. LAHDC was equally attentive to the need to deal with illegal connections. It began by organising meetings with Ladakh's political and religious leaders. The voluntary disclosure scheme used by the income tax department was used as a method to get people to disclose their illegal connections and get them regularised. Since November 2001, more than 4,350 illegal connections have been regularised. The increase in revenue in three years has been impressive (see flow chart: From deficit to surplus). Today, although power production remains the same in Leh, power supply has improved. The combined effect of energy conservation and regularising illegal connections is that the actual consumption drops to below the installed load at times. But the villages in Leh district remain outside this innovative loop. A different and a more decentralised strategy is needed for them. Leh district is planning to replace DG sets with solar and hydel power. Ladakh has an average of 325 sunny days in the year. The intensity and duration of solar radiation in Ladakh is the highest in the world. The daily average solar energy availability per square metre in Leh district is 6-12 kilowatt-hours. The district receives solar energy of over 400 billion kilowatt-hours per day. The actual daily potential is estimated at about 10 per cent of this, 40 billion kilowatt-hours, which is far more than the energy required in Leh district. In July 2001, the LAHDC and the Ladakh Renewable Energy Development Agency (LREDA) presented a proposal worth Rs 340 crore for solar installations in all houses and institutions of Ladakh. The project proposed 24,000 home solar systems, 12,000 solar lanterns and over 2 megawatt of solar power plants. When completed, the programme would put Ladakh at the top in terms of installed solar power systems per capita in the world. The first stage of this project was completed in the summer of 2002 in a record time of four months. 10,000 solar home lighting systems and 6,000 solar lanterns were installed or distributed in 39 villages of Leh and 45 villages and hamlets of Kargil. These villages were not electrified and so remote that the chances of being connected to the power supply line in the near future are remote. The first phase was worth Rs 20 crore, 90 per cent of which was given by the Union ministry of renewable energy. The manufacturer of the photovoltaic cells will maintain the cells for five years. The beneficiaries have to pay an initial cost of Rs 1,000 and, subsequently, Rs 60 per month as instalment. But this money does not go out of the village. It is paid into a revolving fund operated by the village sarpanch. This fund would be used to replace components. Now, LREDA is preparing project proposals for the second and third stages. This would take about four months to complete. While the second stage aims to further the accomplishments of the first stage, the third stage will replace the diesel generator sets with solar power plants. The other focus area for energy in Ladakh is micro and mini hydel projects. LREDA has drawn up a list of 31 sites for making mini hydel projects with a capacity of about 50 megawatt. The National Hydro-electric Power Corporation is building a mini dam (45 megawatt) at Alchi on the Indus river. This dam will also function in the winter, for it will be equipped with a better and more efficient system to deal with silt. Moreover, the prime minister has promised that Leh district is going to be hooked up with the national grid. LAHDC is very excited about this prospect. When the grid begins to hum with electricity, Ladakh plans to supply electricity to 'down' in summer, when there is a great power shortage there. And in winter, when the plains have excess power, it can be supplied to Ladakh. It is widely accepted that panchayati raj is shaping up much better in Leh as compared to other districts of J&K. The first real panchayat elections in the state were held only in May 2001. Even then, modalities of decentralisation of power to elected village representatives were not issued. After coming to power in 2002, the new government under the People's Democratic Party and the Congress has got serious about panchayats. In June 2003, it issued orders transferring 15 subjects related to developmental activities to the panchayats. On a recent visit to Leh, the chief minister Mufti Mohammed Sayeed promised to transfer funds and functionaries to the panchayats within one year. But local self-governance in Leh has some peculiarities. Buddhist or Muslim, Ladakhi society is essentially tribal. The goba -- or the village head -- is elected through democratic consensus and can also be removed by the village at will. Regardless of religion, this headman has a significant social role in the village. When the Dogras of Jammu conquered Ladakh in the mid-nineteenth century, they made the goba the village revenue collector (nambardar) of the village. After 1947, the Indian government continued with this arrangement. But the goba's salary today remains a paltry Rs 2.5 per day. 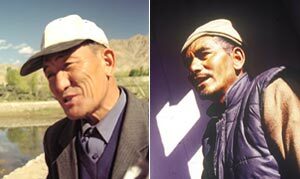 Moreover, as the PDS chipped away at Ladakh's traditional agriculture, the institution of goba -- so integrally woven into the region's agrarian system (for example, the traditional irrigation manager, churpun works directly under the goba) -- also diminished in importance. Today, the position is deemed a great burden and there are several villages where families are impelled to take turns to provide a goba. Haji Mirza Maidi, goba of village Chuchot-Yokma since 1989, says he has continued this long only because of pressure from his villagers. He has not received his revenue official's salary for five years now. The panchayati raj in Ladakh further eroded the goba's traditional powers. The panchayat is in charge of all development works in the village and J&K has a provision for panchayat adalats (courts). But, the goba still retains vestiges of traditional power. Maidi, for example, says that several people still call upon him for settling disputes. But as long as he is a revenue official, he cannot contest the panchayat elections. This has created several conflicts. For example, selecting economically backward people of the village for government schemes (such as the Indira Awas Yojana to make houses for the homeless) was the goba's job earlier. It is now the panchayat's responsibility. People who feel aggrieved go to one institution or the other. In a society that runs on popular consensus, such divisions can seriously hamper decentralised governance. The goba's role as the nambardar creates problems in the headman finding a place in the panchayati system. Tsewang Dorji, former assistant commissioner of Leh, who has worked his way up from the post of tehsildar and is well acquainted with revenue-related work, says: "Taking away the nambardar's post fromthe goba would open the possibility of aligning the headman's position with that of the sarpanch." This would probably require an amendment to the Panchayat Raj act of J&K. "Till that happens, the goba can be made a special invitee at all the panchayat meetings," says Ghulam Mohammed Sheikh of the Leh Development Organisation, which has a programme for supporting panchayats. Wherever the goba and the sarpanch have worked closely, village governance has been successful. Sheikh also points to anomalies and possible legal glitches in the way Ladakh is implementing panchayati raj. For example, after LAHDC's creation in 1995, it was decided that it would function as the district planning and development board (or the zilla panchayat) whenever panchayati raj is implemented. But the 1989 Panchayati Raj act does not mention the LAHDC. This has created a possibility of a conflict, though this can ocur only when the second of the three tiers of panchayati raj, the block develoment committees are created. This is yet to happen in Ladakh. But, possibilities of future conflict do exist. A way out of this mess, though remote, could be notifying Ladakh as a Scheduled Area under the Fifth or the Sixth schedule of the constitution. It can then avail the greater potential these constitutional instruments offer for self-rule. But Sheikh, one of the best informed people on panchayati raj in Ladakh, says there has been no serious discussion amongst Ladakhi leadership about demanding scheduled area status and there is no popular political consensus on this. The most remarkable aspect of the developmental challenges in Leh district is the small margin for error. Resources are highly limited. 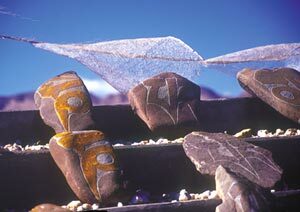 Ladakh's ecology is fragile. Unbridled tourism will imperil the pastures of Changthang that support the pashmina goats and the Changpa nomads. The good news from Leh is that the leadership is reasonably sensitive to these challenges. The reforms in the education system are examples of what a committed leadership can do. There have been several efforts across the country to improve the lot of government schools. But their success has been very limited, to say the least. What is unique about Ladakh is that the LAHDC has kept in touch with several of these initiatives, and actually learnt from these failures. This ensured that it could implement the educational reforms in the face of implicit opposition from the state government. There are also problem areas. For example, LAHDC is yet to declare a policy on ecotourism despite long-standing discussions. Ecotourism is a new concept and there is a lot of confusion about what it would entail for Ladakh. People who have studied the impact of trekking groups coming from Manali in Himachal Pradesh say it is time to charge the trekking operators for the pack animals they bring in. These animals feed at the cost of the livestock of the Changpa. Agriculture, another area of concern, is not something that the hill council can sort out at its level. There is also a clear need to to tap the potential of seabuckthorn without doing long-term damage. Though the present levels of extraction are not much, they are only going to grow. For civic amenities and energy production, the council has plans. Creating a sound sanitation system for Leh town would be a great challenge. About 95 per cent of Leh's people belong to the Scheduled Tribes. So, its political leadership has to take a close look at the protection available under the Fifth and Sixth Schedules of the Constitution. This would require a review of its present agenda of demanding Union Territory status. This is a great time to be a political leader in Ladakh. To make it count. I really appreciate the efforts of the Authors but im afraid this article is very misleading. Statements such as "Ladakhis don't like Jammu and Kashmir much", how can you let such an argument pass, down to earth? Ladakh comprises of both Leh and Kargil and these two gentlemen seem to focus on Leh altogether and not mention about the conditions or the aspirations in Kargil at all. There are so many other erroneous statements. I am surprised down to earth has not done a preliminary fact-finding and published whatever it has been fed with. Please be careful.